Art Gallery of New South Wales Annual Report 2000 , 'Year in review', pg. 8-20, Sydney, 2000, 10 (colour illus.). Hetti Perkins, Tradition today: Indigenous art in Australia , 'Rover Thomas', pg. 136, Sydney, 2004, 136, 137 (colour illus.). Hetti Perkins, Art + soul: a journey into the world of Aboriginal art , 'Dreams + nightmares', pg. 88-153, Carlton, 2010, 102, 103 (colour illus. ), 280. 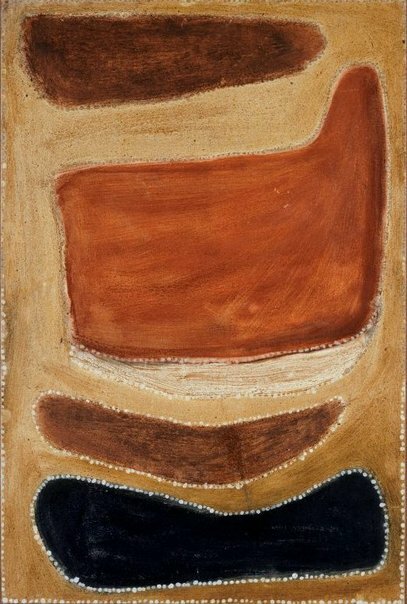 John E. Stanton, One sun one moon: Aboriginal art in Australia , ‘Contemporary art of the East Kimberley’, pg. 239-247, Sydney, 2007, 238 (colour illus.). Look , 'An artist who loved to paint', pg. 31, Sydney, Feb 2004, 31 (colour illus. ).